There has been an enquiry about my organ backrest chair, so I thought I would post a bit more detail. How it all came about is explained in the original post. This was a one-off created by David, our genius organ-builder, after I failed to find anything commercially. The swivelling padded seat is the best part of it, to my mind (it was originally a discard from one of those mobility scooters you see travelling along High Street pavements). 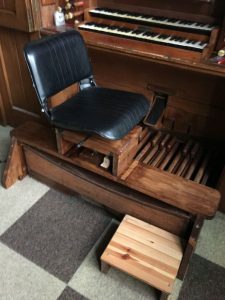 A wooden frame was built to the width of the pedal board, the seat slotted in, and the steps added. It was important to make sure that the seat was in the same position for the player, horizontally and vertically, as was the original bench. 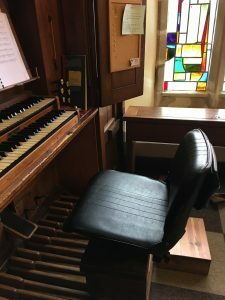 It’s nearly a year since my injury and I’m almost ready to return to the real organ bench, which will be a relief to my co-organists, who have to shunt round bench and chair every Sunday. But I will miss my chair, as it has extra functions: I can swivel right round to talk to the choir, and swivelling half-way wound enables me to face the front for readings, sermon and announcements. I’m still full of admiration for David’s ingenuity. It’s been life-changing! I have emailed you, Joseph. Hope it was of some use. I really sympathise with your problem.